David Cohn has written more than a dozen technical books and hundreds of articles for Architectura, CADalyst, Cadence, Computer Graphics World, Desktop Engineering, PC Magazine, and Upside. He has also helped develop several movie screenplays and is currently working on a non-fiction book. David recently completed an article on Ed Shadle and the team at North American Eagle. NAE is building a vehicle that they hope will break the current land speed record. 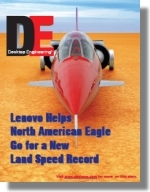 The article will appear in an upcoming issue of Desktop Engineering magazine, but you can read the version that was recently distributed at the COE conference held in Seattle. Many of David's most recent articles can be found online on the Desktop Engineering website. David's most recent book is AutoCAD 2002: The Complete Reference, published by Osborne/McGraw-Hill. The book covers all key topics including drawing and editing in 3D, managing content with DesignCenter, working with external databases, customizing without programming, and more. The May issue of Computer Graphics World magazine features a long-awaited article—Design Driven—detailing how engineering and manufacturing software is used in the fast-moving worlds of CART and NASCAR auto racing. David Cohn authored the cover story for the September issue of Desktop Engineering magazine, on how Team KOOL Green uses SDRC's I-DEAS software to design components for its CART race cars. Engineering Automation Report and CADCAMNet.